Ballyhoo.com - Go ahead! Show off! share your best moments with the world! We help athletes, coaches, and parents — especially in outdoor open-field sports like soccer and lacrosse — get high-quality video highlights of the players in action. We do it all. You relax. We'll capture your team's action with our 18-foot elevated HD cameras, letting you sit back and cheer. Want to film on your own? With information and guidance, we can help you select the best equipment and use it properly. Already have a videographer you like? Great! Let them keep on doing their thing. We'll happily accept their video into our system. An online viewing and editing experience that makes it easy for non-techies, using only their web browser, to convert full-game video into exciting, shareable, and personalized highlight clips and reels. For games filmed by a Ballyhoo crew, standard moments like goals, shots, and set-pieces are pre-marked, guiding your efficient game review. 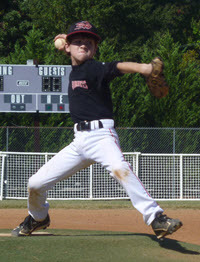 For use on phones at the field by coaches and parents to mark private game-action moments as they occur. They'll be waiting for you in the main app, saving a ton of time in locating and preserving what really matters to you. 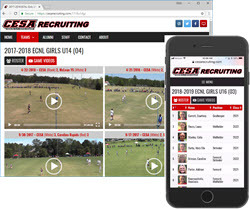 Fully hosted and maintained mobile-friendly sites that let your club promote their athletes to interested college coaches with full-game videos, rosters, and player profiles. While targeted at those college coaches, they're also a nice open way to let family and friends watch your season progress. Though our main app lets you quickly create simple and effective reels, sometimes you want the pizzazz of music, callouts, zooming, intros/outros, and transitions. We partner with professionals who collaborate with you on our platform to make the process efficient and far more affordable than alternatives. Don’t waste your off-field life tediously watching video, scribbling down times for plays you’d like your team to watch, hoping they’ll be motivated and able to locate those sequences themselves. Save tons of everybody’s time — especially yours — by easily selecting and sharing your key teaching moments. Don’t lose those memories! With no software or technical skills required, in a snap you can capture clips and assemble highlight reels to share with family and friends or simply to save for reliving those magical moments in years to come. 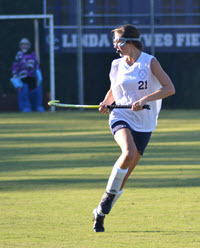 Determined to play in college? Recruiters need to see your skills, but they rarely can do so in person. Help them and yourself by sharing your carefully selected highlight reels directly with your target schools. Get on their radar and stay there! Promote your club and and energize your followers with “plays of the week” clips and reels on your main website, your recruiting website, and social media outlets. Delight your coaches and families with simple yet powerful ways to see and share your league action. We started this business because we needed it ourselves. As founders we could not find an effective, affordable combination of high-quality elevated game video filming services and editing tools to let us get clips and reels of our own kids in action — and still live normal lives. So we built it ourselves. Turns out lots of other parents and coaches were facing the same challenges and love what we did! Our philosophy is simple: Let you do as much as you want yourself — and give you expert guidance for the rest. There really is a lot you can do on your own if you have some simple, easy-to-use tools. We give you those tools. As we grow, we are exploring packages and prices that make the most sense for our customers. Currently we offer clubs and teams a simple “startup” package in which we charge for our videography services at the discounted rate of $299 per game, a cost that includes free access to our online viewing/editing/sharing platform for that game for all team coaches and families. Please contact us for detailed information and pricing for our organization and user application accounts, paid on a monthly subscription basis. Want to learn more? Interested in talking to us about how our services could help your club? We’d love to hear from you. Send us an email at Info@Ballyhoo.com, give us a call at 833-8-SPORTS (833-877-6787), or fill out the form below.